Sanskrit-Wörterbuch / hrsg. von der Kaiserlichen Akademie der Wissenschaften. Bearb. von Otto Böhtlingk und Rudolph Roth. - Theil 1-7. - St. Petersburg : Kaiserliche Akademie der Wissenschaften, 1855-1875. La langue et la littérature sanscrites / par Paul Regnaud. - Paris : Leroux, 1879. 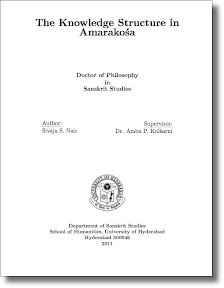 - 36 S.
The Knowledge Structure in Amarakośa / Author: Sivaja S. Nair. - Hyderabad : Department of Sanskrit Studies, Univ. of Hyderabad, 2011. - 176 S.
A Dictionary Sanskrit and English / extended and improved from the second edition of the dictionary of H. H. Wilson with his sanction and concurrence, a supplement, grammatical appendices and an index serving as an English-Sanskrit vocabulary by Theodor Goldstücker. - [Vol. 1]. - Berlin : Asher ; London ; Nutt, 1856[-1864]. - 480 S.
De accentu sanscritico / auctore S. Th. Aufrecht. - Particula prima: De accentu compositorum sanscritorum. 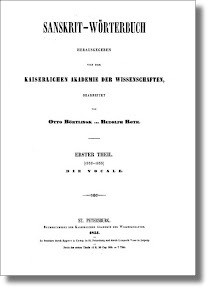 - Bonnae : König, 1847. - XIV, 80 S.
Ujjvaladatta's commentary on the Uṇādisūtras / edited from a manuscript in the Library of the East India House by Theodor Aufrecht. - Bonn : Marcus, 1859. - XXII, 278 S.
The Laghukaumudí : a Sanskrit grammar / by Varadarája. With an English version, comm. and references by James R. Ballantyne. - 4th ed. - Benares : Lazarus, 1891. - III, 379, XXIX S.